Oh man, this is one of those ads that will be with me on my deathbed. It actually might be the first time I'd heard a song where it builds on its own lyrics but cuts off the final word. I suppose there's some musical term for that, but after the original line, it builds like this: "Your Windsong stays on my, Windsong stays on my, Windsong stays on my miiiiiiiind!" No one in my house bought Windsong though, so I have no idea what it smells like. Do you remember the ad? The scent? 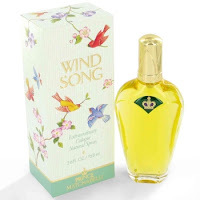 What perfumes did your mom (or colognes did your dad) wear? I always associate perfume and cologne ads with Christmas, as they were always on during Christmas specials, and as far as I know they were aired exclusively during that time. I remember the Wind Song ad because I once videotaped a Christmas special for my daughter (she's married now), and she watched it over and over for years... commercials and all! My mom wore..."and they call her Char-lie!" I was a Sweet Honesty gal myself (from Avon). Still have one of the lovely glass unicorns (with the gold horns!) that it came in for a while. About an inch or so of perfume still in it. I'll never put that (presumably toxic) stuff on myself now, but I'll never toss it either :-) I remember my Mum using White Shoulders. Oh my gosh, it smelled SO BAD. Almost as bad as the Malibu Musk and Sunflowers that permeated the halls of my high school in the early/mid 90s. My mom wore White Diamonds, Grandma wore Oscar de la Renta, and my dad wore some god awful stinky garbage that I don't even want to think about.